Some 1,400 years later, on the eve of Saint Barbara’s feast day, conquistador Sebastian Vizcaino was caught in a particularly wild storm off the central coast of Alta California while doing a little colonial window-shopping for Mother Spain. Panicked, he gripped the ship’s riggings and swore a heartfelt oath of fealty to the first cloud-dwelling saint who came to mind should she see him to the next day. When the storm blew over, Mr. Vizcaino found himself embarrassed to have been seen bellowing at the rain, but alive, and now his port in the storm had a name: Santa Barbara. In late 1996 our hometown saint arrived in the flesh, at least a sanctified piece of her forefinger did, the consecrated digit flying coach from Saint Barbara’s principal reliquary in Kiev. On landing, the digit was literally handed across the U.S. by a network of Eastern Orthodox priests under orders to guard it with their lives. Which is all to say, there is a centuries-old body part of the venerated Saint Barbara in the area. 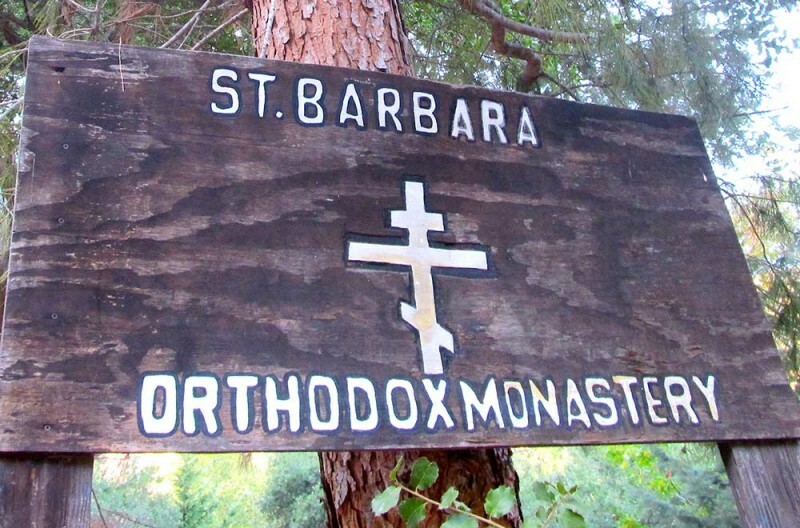 The St. Barbara Orthodox Monastery is nestled covertly in the woods between Santa Paula and Ojai. The aforementioned relic of St. Barbara is in residence there, as are relics of many other saints, both ancient and modern, including a relic of St. Anne, mother of Mary, and a morsel of wood that is purported to have come from the True Cross; the very instrument of Christ’s death. Great power is believed to infuse these sanctified bits of human tissue and cloth and wood. 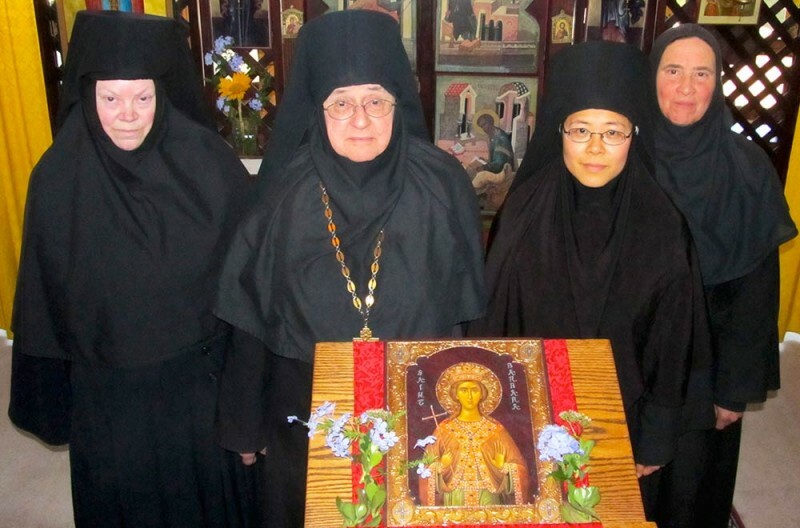 The power objects are overseen by a quartet of monastic Orthodox women of such wit and warmth that they do Saint Barbara and their other venerated roommates proud. Perhaps appropriately, finding the monastery is a challenge. With Mapquest-defying suddenness, a leaf-strewn lane appears alongside a winding country road, dips into a briefly shaded arboreal enclosure, then crosses a little bridge and opens onto a sun-dappled clearing. An imposing gabled house of dark woods and large windows dominates the parcel. The large door opens with a Boris Karloff creak and a woman dressed entirely in black appears, her cowl clinging to her head like a skullcap, her somber dark habit cascading in heavy pleats to the floor. Her face breaks into a sweet smile. She beckons me inside a largish living room of vaulted ceilings, full-length windows and happy ambient daylight. She is Mother Nina; good humored and radiant with energy. This monastery is not a medieval timeworn edifice but a four-bedroom house populated by a family (all Sisters), and still in the throes of its own transfiguration. This spacious sitting room has been long since converted into a chapel, at the near end of which is an iconostasis—a decorous wall hung with painted portraits of saints. I try not to stare. Is Saint Barbara in this room? To the left of this homey place of worship is a dining area, kitchen and a mortal in a baseball cap genuflecting before the sink. It’s the omnipresent handyman Doug, who is noisily running a rooter down the kitchen drain line. Mother Nina looks at me apologetically. “Plumbing problems,” she says. Presently Mother Victoria emerges, a stately woman rustling in her black vestments. She looks a lot like the actress Peggy Wood, the gently admonishing Mother Abbess who, in The Sound of Music, exhorts Julie Andrews to “Climb Ev’ry Mountain.” Abbess Victoria extends her hand and her smile shines like a nightlight. 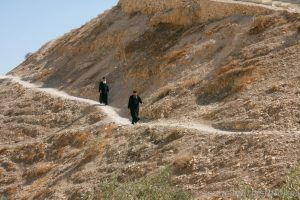 Mother Nina hosts a walk through the monastery grounds. Given the spiritual gravity of the objects the Sisters oversee, one might expect a gold-domed cathedral surrounded by concentric gardens of laurel. What you get instead is a cozy sense of slightly ragged day camp. Whatever manifold gifts the Maker has showered down upon the sisters here, groundskeeping is not among them. The effect is welcoming. But what is a monastery, anyway? 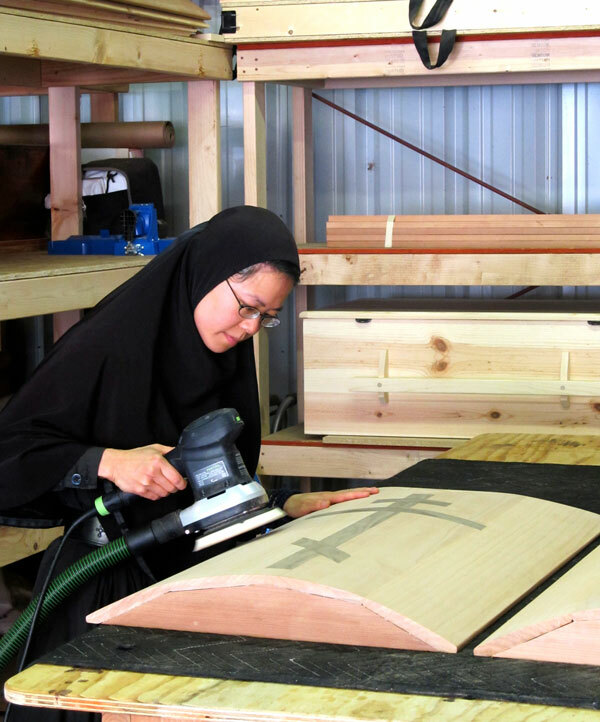 What does it mean to be monastic? How does a monastery…begin? We’re sitting at a table in the dining room. Mother Paraskeva is busily preparing lunch nearby. “Our bishop wanted to see a monastery in Santa Barbara named after our saint,” Mother Victoria continues. “That was at the end of 1992.” The responsibility fell to Mother Victoria. Having been provided no definitive instruction on how to move forward, she acted on the decree as best she could, but the going was very difficult. Until the IRS got involved. She and a willing novice moved into a two-bedroom cottage near the intersection of Castillo and West Victoria Streets, near the bright-blue Holy Resurrection Russian Orthodox Church there. They bought some groceries, the necessary texts, a couple sticks of furniture and began holding the daily round of Orthodox monastic services in the living room. 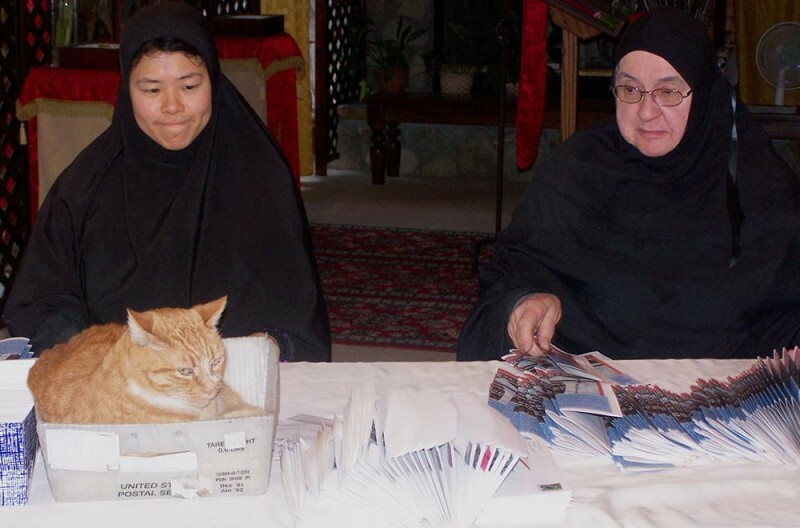 It was slow going, and after a year Mother Victoria’s novice left to go to an established monastery in Pennsylvania. Then, the IRS called. They’d sent the check to the wrong recipient and would she please send it back? “I couldn’t send it back. I’d spent it!” she says. The IRS negotiated very reasonable terms with her and she paid it back over time. The whole episode may constitute the first time the IRS has inadvertently founded a monastery. 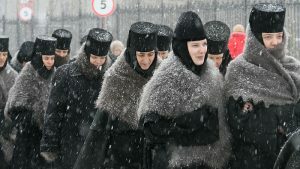 “Since the beginning of the [Eastern Orthodox] church’s existence, no divine liturgy is performed except on the relics of martyrs,” the Abbess explains. That is, a recognized saint’s relic must be on the premises in order to legitimize and consecrate the worship service. As it happened, a bishop acquaintance of Mother Victoria attended a conference of Orthodox bishops in Chicago, where through a completely chance meeting, arrangements were made to acquire a relic of Saint Barbara, from Kiev, in Ukraine. Persevere she did, and now the monastery to which she’d earlier devoted herself began to grow. The cottage gave way to a larger house, and then a still larger one in Goleta. 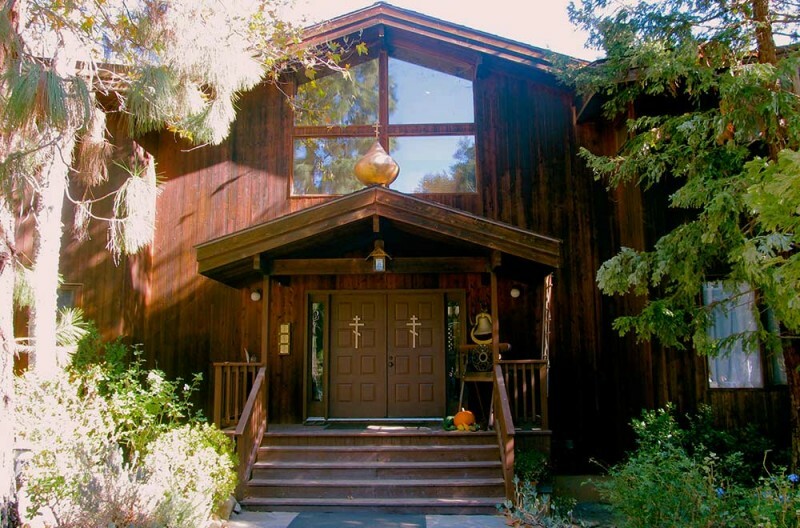 When the gold-plated real-estate values of the Santa Barbara area made future plans for expansion too pricey, the monastery was relocated to its present location near Ojai. Mother Nina walks ahead. The winding dirt path meanders between trees and stumps, tire swings, the occasional overturned lawn chair. Here and there, one is surprised by a jarringly colorful portrait of a saint, painted on a placard about the size of a cutting board, the style decidedly faux Byzantine. The glossy, vibrantly colored boards are pleasantly out of place in this mild riot of flora and sun. To each of these beautiful, stylized portraits is appended a sanctified bit of sometimes ancient human tissue, the fragment viewed through a tiny metal-ringed porthole called a theca. I keep leaning in and squinting. What do I hope to see? When I apologize for my frank fascination with these pieces of simple matter, Mother Nina schools me. My mind wanders briefly to the Higgs boson, the so-called “God particle,” long sought and only recently unveiled in an unimaginable fusillade of high-energy collisions within the Large Hadron Collider, a donut that is 17 miles round and 328 feet beneath the Swiss-French border. Since the Age of Reason, we’ve been preoccupied with the notion of matter, with its essence. It would seem the nature of matter—its ability to hold a charge or contain Godhood, as it once is famously said to have done—is of central spiritual concern to Eastern Orthodoxy. It is an interesting twist on materialism. The leafy property ambles back to a dry creek bed. From these foothills, the Santa Ynez Mountains loom in unfiltered sun, the dominant feature from this vantage a forested glacial valley as smoothly gouged as the divot spooned out of a newly opened carton of ice cream. Need one have been martyred to be a candidate for sainthood, I ask? No. 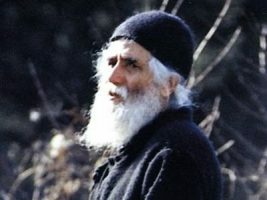 To illustrate, Mother Nina tells the story of Saint Alexis of Ugine, a “modern” saint whose priestly life of service, beatifying privations and ceaseless suffering make the biblical Job look happy-go-lucky. Alexis died of illness and in great pain in 1934. When 20 years later his grave and several others stood in the way of developing a new apartment complex in the French alpine town, a crew of city workmen dispatched to disinter the progress-slowing corpses found Alexis about four feet underground, sans coffin, looking as fresh as the proverbial daisy. His burial clothes were unscathed and new, his flesh unmarked, the only indication of any time having passed was the disintegrating metal ring that held his bible. That is, he hadn’t putrefied. As we walk the grounds, I find I’m self-consciously folding my hands behind my back in the manner of an ascetic strolling thoughtfully through a glade. Mother Nina, meanwhile, holds forth with the uncontained giddiness of a kid showing off the birthday haul. She is not the silent, eye-averting monastic often portrayed in films. Neither are her three sisters. Mother Victoria projects the quiet strength of tempered steel behind a knowing smile and squints girlishly when she chuckles. Mother Olga is a seemingly reticent holy woman until you notice she is often murmuring a running commentary of wry one-liners under her breath. When I mention that I detect an accent, Mother Olga quietly corrects me, “I don’t have an accent, y’all do.” A Texan! Mother Paraskeva is the youngest of the group, the soft-spoken house philosopher who will eloquently parse the epistemological shadings between the Eastern and Western approaches to Things Unseen, speaks of Aristotelian rationalism with quiet authority and who, I’ve been assured by her compatriots, can shimmy handily up a 30-foot rope swing. Through the whole of our short tour, Mother Nina constantly and reflexively yanks at the back of her cowl, an endearing gesture that signals she is not a translucent mystic from a remote Himalayan summit. She and her sisters are but exceptionally curious, dedicated people who have found a way to sweep aside all distractions in the daily pursuit of the singular question they have for God. How close can I get? Mother Olga approaches a bell hung by the front door. “I’m under orders to make some noise,” she deadpans, and begins fitfully ringing. At 15 minutes after noon this and every day, the sisters hold a service in which candles are lit in the midday chapel. This is part of a daily cycle of liturgical services that begin in the pre-dawn hours. There is bowing and crossing and the sisters retreat to three corners of the room, where daises await with an open text. Mothers Nina and Paraskeva share a dais the way George and Paul used to share a mic in the early days of Beatlemania. Each sister in turn then reads aloud, the words issuing forth in a mesmerizing singsong. It’s lovely and hypnotic and transporting. Twenty minutes into this ceremony, quite suddenly, Mother Victoria sounds out a quick four-note figure to guide the sisters in pitch, and they burst as one into a velvety Beach Boys, close-harmony canticle, with traces of the Mamas and the Papas. It’s a glorious surprise. At completion they cross themselves and without further ceremony quietly disperse to go about their daily business. “She doesn’t know whether to go up or down,” Mother Victoria replies, straight-faced. 1. The parochial details of the saints’ lives and martyrdoms lend themselves to sometimes odd vocational patronages. Saint Barbara’s anger-management-needing father was struck down by lightning, so explosions as a phenomenon are attached to Barbara, making her the patron saint of armorers, gunsmiths, miners and anyone else whose work with explosives leads to frequent on-the-job prayer. The unreliability of early cannons, which just as often blew up their hosts as the enemy, gave rise to Saint Barbara’s being invoked as a divine protector of artillery persons, and an ancient military order exists into which artillery persons may still be inducted. The Order of Saint Barbara is a military honor society for both the U.S. Army and the U.S. Marine Corps Artillery, including field artillery and Air Defense Artillery. This is considered a very high honor. The area on a warship where ammunition is stored is known to sailors as The St. Barbara, and the blast-proof enclosure that prevents wayward ammo from vaporizing hapless sailors as it’s being loaded into heavy shipboard guns is called the barbette. Pravmir.com thanks the editors of Mission and State for the kind permission to repring the article.